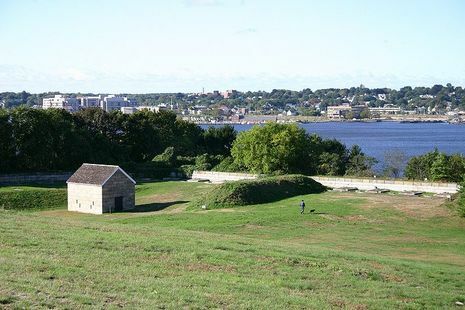 One of the last battles fought during the American Revolutionary War was fought near New London, Connecticut at a small fort called Fort Griswold which was an outpost held by around 164 Connecticut militia under the command of William Ledyard. A British landing force from New York City landed near the coast to engage the fort near the New London port. 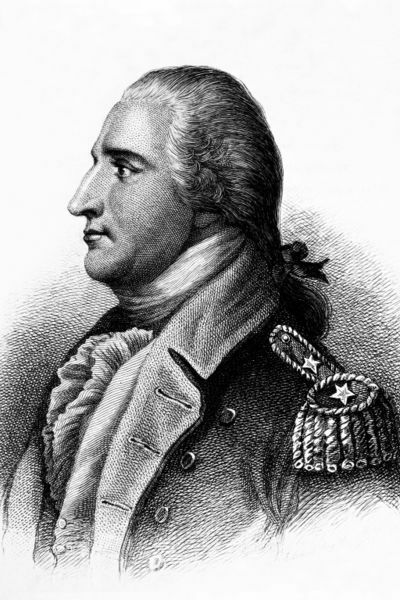 Commanding the British 1,700-strong force was the former Patriot commander Benedict Arnold, the colonial-turned-traitor who was ordered to take the harassing fort and its garrison. On September 6, 1781, Arnold led the British into at attack against Fort Griswold. Although the defenders fought bravely and fiercely, they were overwhelmed by the number of British troops attacking which scaled the walls of the fort, and opened the front gate allowing the rest of the army to pour into the compound. Only about 20 Americans managed to escape from the fort, leaving behind some 85 killed and around 60 wounded to the British who suffered some 48 dead and 145 wounded in the taking of the fort. The fort was then ordered burned down by Arnold who then moved the British force back to New London, and then to New York. Let us glance at the town of Groton this fifth of September, 1781. A number of inhabitants had returned from the war, or were at home on a furlough (among those killed in Fort Griswold the following morning, fourteen bore the title of Captain, as also three who were wounded), so that there was a general rejoicing, with a sense of peace and safety. The usual every day tasks had been taken up, and Captain William Latham was building himself a new house. In the early evening, when work was put aside, neighbors and friends gathered here and there in little groups, discussing affairs and talking over the latest war news. Lieutenant Park Avery, who had been with Washington, was at home on a furlough, and it is probable he brought the word of the movement south to crush Cornwallis. If so, how eagerly and anxiously the matter was gone over; and then the more homely topics were touched upon, good weather predicted for the morrow, and the unusual occurrence of the wind blowing from the north spoken of. So they separated for the night. It was at three the following morning that Sergeant Rufus Avery, who had charge of the garrison at Fort Griswold, saw a fleet of thirty-two vessels near the entrance of the harbor. He immediately sent word to Captain William Latham, who came at once to the fort. After viewing the fleet, he despatched a message to Colonel William Ledyard, who quickly responded. As the latter stepped into the boat to be rowed across the river he turned to those about him and said, "If I have this day to lose either life or honor, you who know me best know which it will be." Upon his arrival at the fort he ordered two guns to be discharged, the usual alarm. Captain William Latham and Sergeant Rufus Avery fired them at regular intervals, but as the sound of the second one died away, a third was discharged from the fleet, as Benedict Arnold knew well the signal for help, and that three guns were fired when a prize had been brought into the harbor, or a cause for general rejoicing. Seeing this would prevent the troops from coming to the fort, Colonel Ledyard sent swift expresses to call every captain of a militia company to hurry to their aid, and a message was also sent to Governor Trumbull. All was now hurry and confusion in the town. Groups of people could be seen hastening to the hill near the fort, pointing to the fleet and talking in excited tones. Others were standing with clasped hands and tears running down their cheeks, as they parted never to meet again in this world. The women and children, on horse-back and in wagons, were being sent to places of safety beyond the town. Among them, Colonel Ledyard's wife, with her young baby by her side, was carried on a bed to a barge and sent up the river. The guns continued to call for assistance, always answered by a third one from the British fleet. A number from neighboring towns, fearing there was trouble at the fort, arrived in time to render aid; a few, who were plowing in the fields, left their oxen yoked; but the greater part, supposing a prize had been captured, kept on with their work, and it was not until the smoke arose from the burning of New London that the attack became generally known. During this time the British fleet was slowly coming up the river, and it was at eight o'clock in the morning that eight hundred officers and men, with horses, guns, and carriages, were landed at Groton, and an equal number on the opposite side of the river. Captain Shapely of Fort Trumbull, seeing that he was likely to be overpowered by the enemy, fired one volley, spiked his guns, and, obeying Colonel Ledyard's orders, started with his small company of men to cross the river. A number were badly wounded before reaching Fort Griswold. The army at Groton, having been divided into two companies of four hundred each, under the charge of Colonel Eyre and Major Montgomery, appeared in sight about nine o'clock, and were immediately fired upon from the fort. Colonel Ayer led his men to the woods half a mile away, whence they ran forward in broken ranks to the shelter of the rocky height about one hundred and thirty yards from the fort, while Major Montgomery stationed his men a short distance northeast of Eyre. Shortly after, Colonel Eyre sent a flag demanding an unconditional surrender. It was one of those hot summer days that come early in September; the river flowed without a sound; in the harbor lay the British fleet, while outside thousands of little waves rippled and danced in the sunlight. Save for the sound of the crickets, for a moment all was still, as Colonel Ledyard looked his fellow officers, townsmen, and old friends in the face, asking, "What shall be done?" The flag above them scarcely stirred in the breeze as the little company of one hundred and fifty-five or one hundred and sixty men, gathered in the fort, came to the decision, "We shall not surrender." Captains Elijah Avery, Amos Stanton, and John Williams carried the answer that sealed their death-warrant. Again the flags met, and the second summons added that, if the British were obliged to storm the fort, they should put martial law in force. Captain Shapley carried the reply, "We shall not give up the fort to them, let the consequences be what they may." Earlier in the day Benedict Arnold, seeing how many vessels were being sent up the river to places of safety, despatched a staff officer to hurry Colonel Eyre in making the attack, but upon reaching a hill in New London, and seeing that Fort Griswold was "much more formidable" than he supposed, he sent another officer to countermand the order to assault. But it was too late, as Colonel Eyre had summoned the fort to surrender. Upon receiving the answer carried by Captain Shapley, Colonel Eyre immediately put both regiments in motion, advancing in solid column. When they reached open ground, Colonel Ledyard gave the word, and an eighteenpounder, double shotted with grape, cleared a wide space. The British then broke into a scattered skirmishing order and quickly advanced to the fort, where every man of the little garrison fought desperately. Colonel Eyre fell seriously wounded. Major Montgomery took his regiment around to the north, and entered the redoubt, where they emerged, charging upon the fort, which was now surrounded by six hundred soldiers, watching every head that rose above the parapet to load a gun or fire a musket. Just as Major Montgomery was entering the ditch, where he had valiantly led his men, he fell dead, thrust through with a spear. His men rushed to avenge him, and the fight raged furiously. Lieutenant Park Avery turned to his eldest son, a boy of seventeen, "Tom, my son, do your duty." "Never fear, father," the boy replied, and the next instant fell. "It was in a good cause," said his father, as he carried him to the barracks. The gate of the fort was broken in, but the soldier who did this was shot dead. The enemy, four or five to one, were breaking the pickets down, shooting the defenders, and climbing up the walls. Solid shot was dashed upon their heads, there being no time to load. The flag was shot away, and the British cheered; in another instant, it was raised on a spike-pole by Luke Perkins. The enemy rushed into the northeast bastion and broke down the gate. The day was lost. Colonel Ledyard ordered his men to throw down their arms and shouted a surrender. From the parapet the British continued to fire upon the well or wounded, armed or unarmed. Captain Shapley fell. Eyre's men came swarming in over the southwestern bastion. Montgomery's men, led by Major Bromfield, rushed into the fort. Raising and lowering his sword, Colonel Ledyard marched to meet them on the parade, when the voice of an English officer was heard, "Who commands this fort?" "I did, but you do now," said Ledyard, extending his sword to Major Bromfield. The next instant he fell dead, thrust through and through.